Michael Ginzberg, a respected scholar and current dean of the business school at Yeshiva University, has been named dean of American University's Kogod School of Business. Ginzberg, who has led two well-known business schools, will take the helm at Kogod on July 1, 2011. He will lead a business school that has grown by approximately 300 students in recent years and continued its march to national prominence. Ginzberg’s appointment follows a national search. "Dr. Ginzberg has had a distinguished career replete with successes," said Provost Scott Bass in announcing the appointment. "I know he will lead the Kogod School to the next level of greatness and continue to build the college’s interdisciplinary partnerships and fiscal strength." Kogod enrolls more than 1,600 students in four distinct undergraduate programs and six graduate programs including the MBA and a new master's of science in sustainability management. The school has more than 115 faculty and staff and is highly ranked for excellence in business education. The Kogod School of Business is accredited by the Association to Advance Collegiate Schools of Business (AACSB International), the highest standard of achievement for business schools worldwide. "Kogod is an outstanding school poised for further growth," Ginzberg said. "I'm thrilled at the opportunities within our reach, across campus, in the nation's capital, and internationally." Since 2007, Ginzberg has served as dean of the Sy Syms School of Business at Yeshiva University, where he is also an associate provost and professor of management and information systems. Before joining Yeshiva, he was dean of the Alfred Lerner College of Business and Economics at the University of Delaware. He also served as associate dean at the Weatherhead School of Management at Case Western University, where his responsibilities included all graduate professional schools as well as the school’s international activities. Ginzberg has a long record of transforming schools. 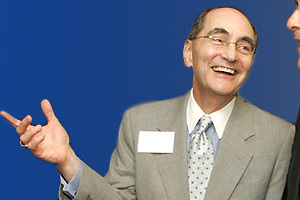 At Yeshiva, as dean he developed and implemented a strategic plan that radically transformed the business school's size, structure, and reputation. He oversaw the introduction of the school’s first graduate program—a master’s degree in accounting—and led the school’s successful accreditation plan. He also expanded the school's programs in entrepreneurship and helped give the undergraduate curriculum better flexibility and integration across business disciplines. At the University of Delaware, he negotiated a $10 million contract with the US Agency for International Development to develop a new graduate school of business and MBA program in Bosnia and Herzegovina, and he successfully fulfilled the contract. At Delaware he also supported development of the Weinberg Center for Corporate Governance, the premier governance center in the United States. He also helped increase the size of the undergraduate student body—the freshman class grew by 38 percent—and he developed programs to substantially boost recruitment and retention of underrepresented student populations. After Hurricane Katrina, Ginzberg spent a year as a pro bono special consultant to the president of Tulane University. At Tulane, on administrative leave from Delaware, he led the development of a strategic plan for the university's new School of Science and Engineering. The plan included new undergraduate and graduate programs, integrating science and engineering faculty. Ginzberg earned a PhD in management from the Alfred P. Sloan School of Management at the Massachusetts Institute of Technology, an MBA in economic analysis from Iona College, and a bachelor of science in management from MIT. His extensive list of publications includes several books and edited volumes, book chapters, reports, and articles and proceedings.